I've been watching a lot of woodworking videos on YouTube recently. No, wait, come back. A while ago I found a rich seam of old motor racing documentaries on YouTube. They were mostly from the 1980s and almost always narrated by Martin Jarvis. In spite of the fact they were about racing cars, however, the thing which I enjoyed the most was watching a bunch of Midland craftsmen carving, from mahogany, a wooden former for the casting of a new engine block. The sight, sound and skill of it were mesmerising. Always a wise owl, I wondered if perhaps there might be some more examples of woodworking for me to watch on the site. Of course, there were, as everything ever made is now on YouTube. It is by some margin the greatest site on the internet, ever. So, this is how I came to start watching a lot of YouTube videos about woodworking. I can't particularly explain why I have been watching these videos. They are, for one thing, mostly tutorials and I have no particular interest in the practical side of woodwork. Make no mistake, if someone has a load of nice sharp tools and wood ready for me to have a wallop about with, I'd be in there like a shot. But to commit to making it happen for myself, the thought has never really crossed my mind. My last experience of woodwork came in Design & Technology class, which I stopped doing when I chose my subjects for GCSE in 1994. The ultimate result of this was a lot of unfinished crap and one tetanus shot. And yet, I've been watching a lot of woodworking videos on YouTube recently. Hours and hours of them. I believe there is a basic desire in every human being to make things. To watch a craftsman produce a tangible object is extraordinarily, if often inexplicably, satisfying thing to do. But more than just satisfying. There is something profound in it. Something which is closer to the soul than our conscious brain can properly understand. I quickly found a favourite producer of YouTube videos. It is Paul Sellers. Paul Sellers is a 60-year old British furniture maker and master craftsman with 45 years of experience and all the necessary tools to share and impart this knowledge. His videos are sometimes short affairs - mythbusting, tool maintenance or useful techniques - and sometimes hours and hours of masterclasses, where the viewer could, if they wanted to, make the piece along with him. The first video of his that I watched teaches how to carve a spoon using simple hand tools and I was absolutely hooked from the first axe cut. Sellers is the teacher of your dreams in these videos. Calm, unambiguous, accomplished and authoritative without ever being steadfast, set in his ways or preachy. Plus, just the merest glance will tell you that he knows his stuff. What Mozart was to the pianoforte, Paul Sellers is to the Bailey-pattern number 4 bench plane. Coupled with the zen-like delivery - think Bob Ross, but with less happy clouds and more old-fashioned Salford common sense - I honestly think that anybody, of any walk of life and any set of interests, could happily lose themselves in his films. I suppose that I am, too, a craftsman after a fashion. I, like Paul Sellers, have ploughed my own furrow in a world increasingly dominated by mechanical shortcuts and kept faith with traditional techniques. He does it with a lump of oak, I do it with bits of paper and pens. 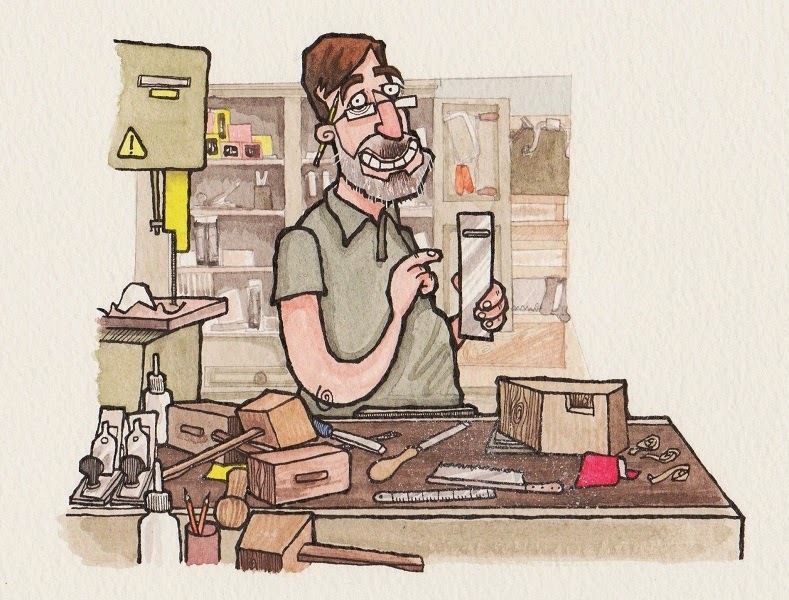 Although I may never necessarily do any woodwork, I have learned an awful lot from him. The importance of believing in your method. The fundamental seriousness of following your own vision. The simple joy of doing things rigorously, patiently and properly. These are basic lessons but also ones that strike at the very heart of learning about being human. I would like to thank him for that.